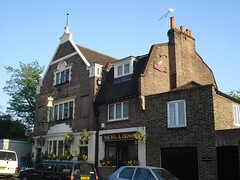 Fuller's pub on the river in Chiswick. It's fairly smart-looking inside. It also has a patio overlooking the river at the back and some seating actually out on the riverbank itself photo. On a Friday evening in October 2007, it was reasonably busy though not overcrowded. On a Tuesday evening in May 2008, there were seats left around 7pm but it was getting quite busy by 8pm. On a Friday morning in July 2013, it was unsurprisingly quiet just after the 11am opening time, though there was one other customer, apparently a regular. In May 2008, Strongbow was £3.25/pint and I think Honeydew was £3.15/pint. I think they also had all four of the Fuller's usuals (Pride, Discovery, ESB, Chiswick) on, plus I saw taps for Staropramen and Leffe. Jugs of water and glasses on the bar to help yourself (it had been a rather hot day — not sure if this is normal practice). Landlord appears to be something of a character (in a good way). In July 2013, a half-pint of lime and soda was a rather exorbitant £1.40. According to the Bell & Crown website as of July 2013, food is served noon-3pm and 6pm-9:30pm Mon-Fri, noon-9:30pm Sat, and noon-7:30pm Sun. See also photo of menu from the same month. In May 2008, we tried the moules marinieres (£8.50 for a main course portion including a smallish amount of baguette), which were fine; and the steak pie, which was a stew in a dish with a puff pastry lid, i.e. not a true pie. The food side on this occasion seemed to be a separate operation from the beer side; there's an open kitchen and serving point around the back of the bar, and we were asked to order our food from there. Accessibility: No steps to get in, and the bar, toilets, and much of the interior seating are on the same level (some seating is on a dais, some is down a few steps). The riverbank seating (but not the patio seating) can be reached step-free by going back out of the front door and down a little alley. Last visited by Kake, July 2013. Opening times taken from the Bell & Crown website, July 2013. Last edited 2013-07-13 23:05:23 (version 17; diff). List all versions. Page last edited 2013-07-13 23:05:23 (version 17).